Sure it is only from kindergarten but it was a nice day for the kids. 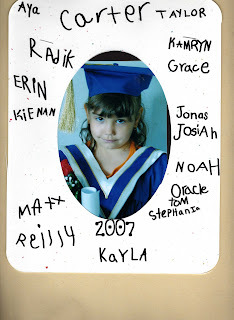 The cap and gown was cute, they had an assembly and got their diplomas and now Kamryn is done her 1st year of school (sniff sniff). I don't think this year could have went any quicker? Time moved doubly fast this year. One started elementary school another Jr high. Kamryn thoroughly enjoyed her 1st year of school, she has waited for quite a few years. Watching her big sister go every day made it even more of a "want". We lucked out in having an awesome teacher, Mrs. A rocked. It has been 3 days and Kamryn already misses her. I hope next years teacher is a good one, I had heard rumors of the teacher who could possibly be teaching 1st grade and was scared. But it seems we have a new one coming in so I am hoping all will go well. Our long weekend has been very quiet. There are Canada Day fireworks tonight, unfortunately they don't start till 11pm which is a little too late for Jillian. It stays bright very late these days. But we had a yummy bar-b-que, my Aunt makes the best potato salad. Tomorrow I am off to see if I can get a patio set, the picnic table that was here when we moved in is a little rickety looking well that and my cousins dog thought it quite the chew toy last summer. She looks so cute in her cap and gown. My middle son will start Kindergarten this fall. He is ready. Not sure if I am though! Oh, Fireworks....we can't do fireworks this year...we are in a real bad drought. Which makes me sad. You got to have fireworks on the 4th. Have a great day!